Once you have selected a video source iSpy will show you the main configuration screen. You can get back to these settings at any time by right clicking the camera on the iSpy Surface and clicking "Edit". Advanced Camera Properties/ Inputs: This section only applies to USB cameras and allows you to change frame-rates and resolution settings. Depending on your cameras drivers these may or may not persist between restarts of iSpy. 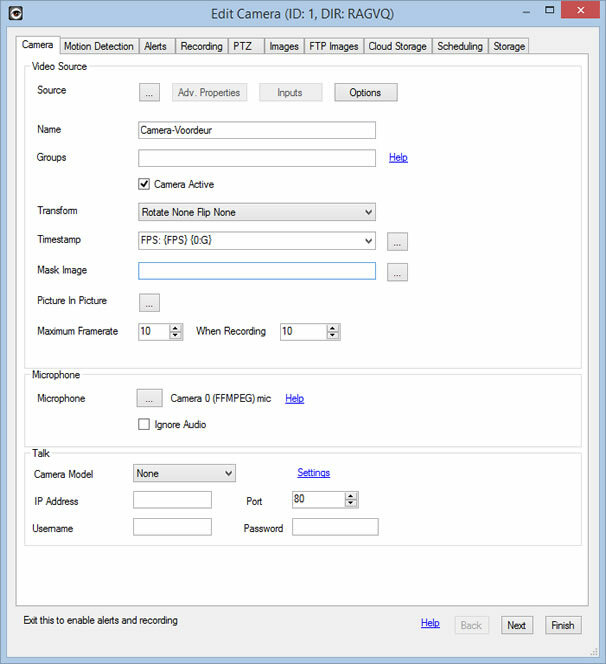 Name: Once you have specified a video source iSpy automatically sets a name for the camera in the name field to match. When using a VLC source this name frequently has usernames and passwords in it so check the name before continuing. It's a good idea to give the camera a location based name like "Office Cam" or "Front Door Cam" as this will help differentiate the feeds when viewing them later. Active: The camera active checkbox is a live control - that is it switches the camera on or off immediately without waiting for you to click Finish. There are quite a few live controls in these pages. Flip-X, Flip-Y and Rotate 90 are all live controls and are used to make the live feed orient properly (useful for example if your camera is mounted upside down on the ceiling. Timestamp: iSpy overlays a timestamp field displaying the Frames Per Second (FPS) along with the current time. You can change the format of the timestamp using this combo box. The curly brackets are special formatter expressions, you can find some other examples here. You can position this text in a number of places using the drop-down to the right of this. Mask Image: You can apply a transparent PNG file to iSpy to black-out sensitive areas of the cameras view using this. Picture in Picture: Overlay other camera feeds on this camera - More Information. Max Framerate: The default framerate limiter for the camera. When Recording: The framerate limiter for the camera when recording (only available for mp4 files). Microphone: The microphone list displays available microphones that you have already added to iSpy. Pairing a microphone with a camera enables iSpy to record video on sound detection or sound on video detection. The recordings are then combined when iSpy creates the .mp4 file. If you want to pair a microphone with a camera you will need to exit the camera settings, add a microphone to iSpy and then edit the camera and select the microphone from the list.